'massive, serious and flagrant violations of human rights and of international humanitarian law' resulting 'from acts of armed aggression perpetrated by Rwanda on the territory of the Democratic Republic of the Congo in flagrant violation of the sovereignty and territorial integrity of the Democratic Republic of the Congo, as guaranteed by the United Nations and OAU Charters'. The ICJ's judgment in Armed Activities on the Territory of the Congo (New Application : 2002) (Democratic Republic of the Congo v. Rwanda), the court declined to exercise jurisdiction based on a laundry list of treaties. It held inapplicable, for instance: the 1984 Convention Against Torture, for the reason that Rwanda was not a state party; and the 1948 Convention Against Genocide, for the reason that Rwanda had attached a pertinent reservation to its ratification of the latter treaty. 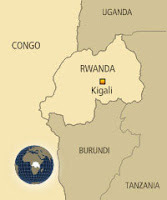 Nor did it agree with the DRC that Rwanda had waived its right to object to jurisdiction.